After speech Lula was carried off makeshift stage on the shoulders of dozens of supporters who remained with him during his two days at the Metalworkers Union building. 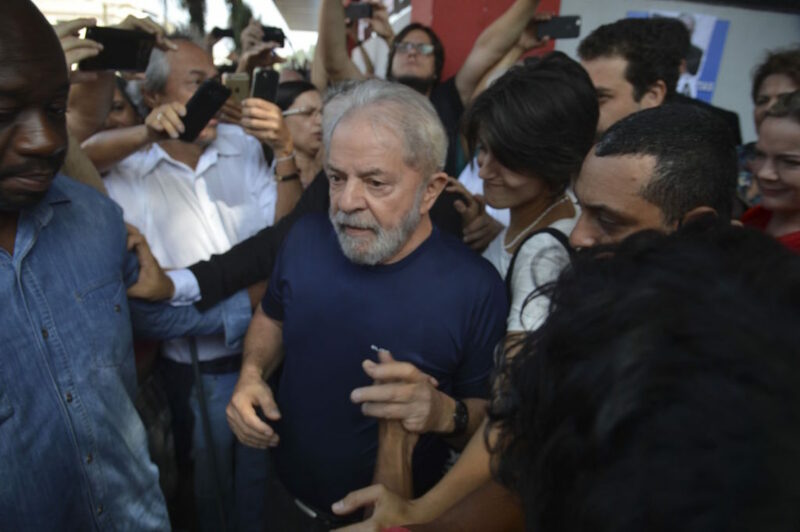 SÃO PAULO, BRAZIL – After almost 24 hours after the deadline to surrender to authorities, Brazil’s former president Luiz Inacio Lula da Silva finally left the Metalworker Union building in São Bernardo do Campo, outside of São Paulo. 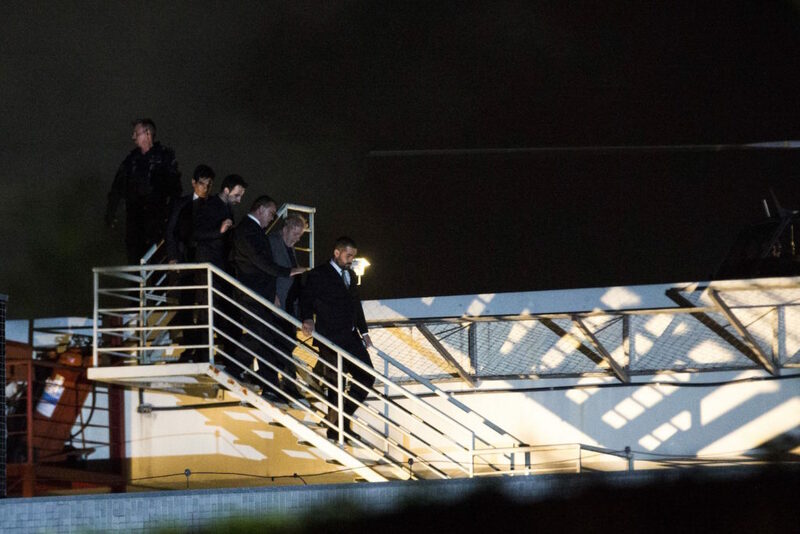 By the middle of the night the two-term president was in Curitiba to start serving his twelve-year sentence. Former President Luiz Inacio Lula da Silva among his supporters at the Metalworkers Union building on Saturday, photo by Rovena Rosa/Agência Brasil. Lula defied a court order to turn himself in by Friday at 5PM by stating that he would only present himself to authorities after attending a Saturday morning mass in remembrance of his late wife, Marisa Leticia, who died last year. The mass, conducted outside the union building and in the presence of hundreds of supporters who had spent the night gathered to hear the former leader, felt more like a last rally than a religious ceremony. Catholic Bishop Angelico Sandalo Bernardino, a staunch Lula supporter, led the mass a makeshift alter on top of a sound truck, but was interrupted several times by chants of “Don’t Give Up” and “Resist” from the crowd. Lula, with close friends and colleagues always surrounding him, spoke to cheering supporters after the mass, stating that although he was surrendering to authorities he was innocent. “History will prove that the guilty parties are the prosecutors who prosecuted me, the judge who judged me,” said Lula. “I do not forgive them (judges and prosecutors) for giving society the idea that I am a crook” added the former President demanding Judge Moro to show him the proof the official had against him. Lula also blamed the Brazilian media and prosecutors for the death of his wife, who died of an aneurism in February of 2017 at the age of 66. 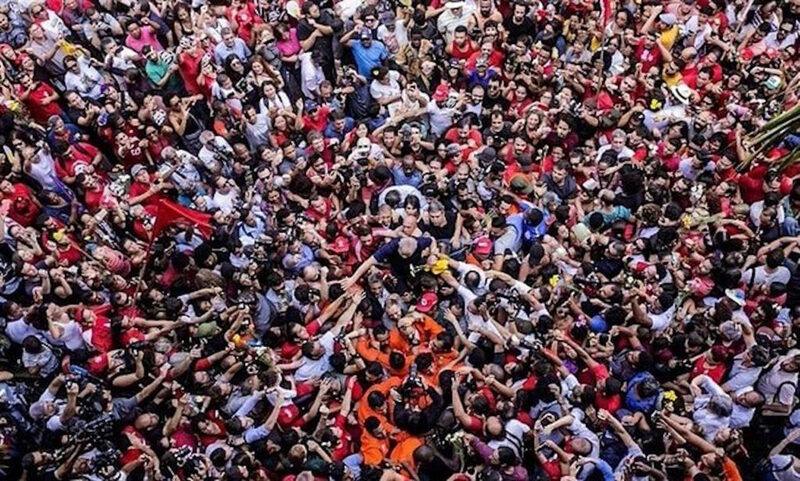 Lula was carried by hundreds of supporters after giving speech, photo internet reproduction. The former president was carried off the stage on the shoulders of dozens of supporters, back to the union building. When Lula finally decided to head to the federal police headquarters in São Paulo, his car was blocked by hundreds of supporters unwilling to allow the former leader to leave, forcing Lula to return to the building that had been his home for the past two days. The sun was already going down by the time Lula was able to walk out of the Metalworkers Union building and finally make his way to police headquarters to turn himself in. He was taken to the federal police headquarters in São Paulo and then by helicopter to Congonhas Airport where a single engine plane was waiting to take him to Curitiba. Although Brazil’s federal police has several modern new jets, officials opted for the single engine, which is one of the older, slower aircrafts of the fleet. The trip to Curitiba took a less than two hours. Former president Lula arrives in Curitiba to start serving his twelve year sentence, photo by Marcello Casal Jr./Agência Brasil. In Curitiba he was taken directly to the federal police headquarters where a special room was set up for the former leader to start serving his term. The room has no bars on the windows or doorway, a private bath and will be equipped with air-conditioning and a TV set. Lula was convicted of money laundering and passive corruption in July of 2017 and sentenced to nine years. During the January 2018 appeal, the courts increased his jail time to twelve years and one month. Last week the Supreme Court rejected his habeas corpus to remain free until all appeals were heard. Time for the LEFT corrupts to go to jail too. A man can’t be above the LAW because he has thousands of fans….. The corrupt should go to jail, with no attention paid to a political party nor economic status, if you want justice to prevail. elbobodelayuca, those words are well spoken. Excuse me but this was no mass at all. First it was announced as a mass, but later they changed the meeting for an ecumenical act, whatever that means. In reality it was just a political rally. It was a shame that an elderly bishop was used for political propaganda of the worst kind, to support a condemned corrupted politician.